Learning to live and love handmade. Spring break week is quickly approaching. Never fear! My Spring Break Round-up is here! I had so many wonderfully crafty folks enter my May Giveaway Day Beginning Sewing giveaway. Sure, I went through ALL the Sew, Mama, Sew! giveaway participant lists and entered my fair share (and probably a couple other people’s fair share as well!) of giveaways. I also collected 15 or so new blogs to add to my reading list. 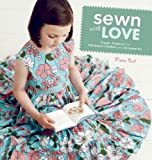 But the best part of the entire event for me was getting to know some of my readers and fellow bloggers through your lovely, sometimes funny, and often inspiring stories about how, when, and why you began sewing. In appreciation and admiration for all that you crafty ladies are doing, I’m featuring some of my favorite blogs and shops from all those that commented on my Beginning Sewing giveaway post. Thank you EVERYBODY for entering and telling me your stories and a special thanks to those of you who were sweet enough to share pictures of your work. Keep crafting and on with the list! Tigerlily Tinkering – Melissa Q’s blog is part of a collective for a group of crafty friends. I especially liked that she’d done several of the same projects I’ve done – the felt crown, the smock from Bend the Rules Sewing. I'm Emily Flippin Maruna, mama to two beautiful little girls, PZ and Q and wife to Franz (Hubs). Check out the About page if you want to know more about me and just what this Handmade Experiment is all about. I answer questions here on the site and love feedback so make sure to speak up and check back frequently! I can also be contacted at flippincool@gmail.com. Enjoy!